A beautifully illustrated, paperback picture book edition of this well-known and much-loved sing-a-long story. 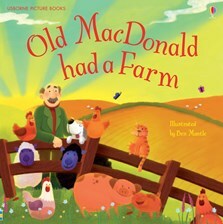 The story of farmer Macdonald and the multitude of noisy animals who live on his farm, quacking, mooing and neighing all day long! Perfect for young children who can follow the story as it is read and join in for the E-I-E-I-O.